Video footage has gone viral of the first lady Iriana Joko Widodo carrying a child during a public campaign in Gebang Market Fishery Port, Cirebon regency. 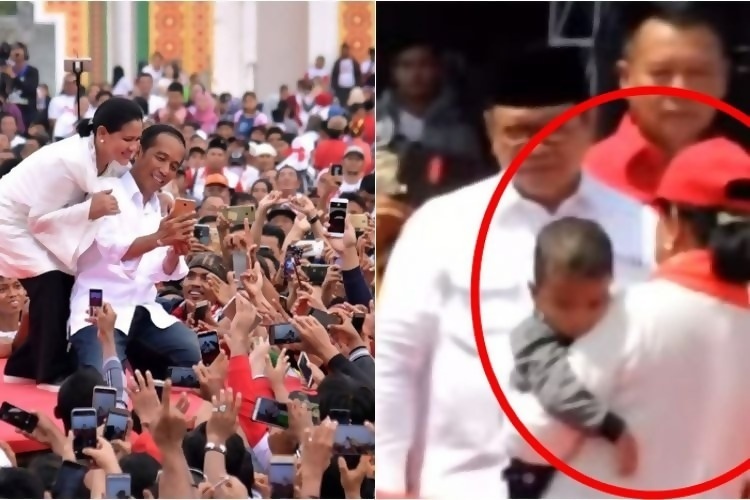 The 2-minute and 19-second video shows Iriana, who was standing behind the incumbent president Joko Widodo, walking to the front of the stage to carry a child, before proceeding towards the backstage. Iriana then came back to usher another child, and headed to the backstage. Jokowi, who was campaigning for his programmes, responded to his wife’s initiative. “Do not bring children to a campaign, it’s not allowed,” he exclaimed. The Jokowi – Ma’ruf campaign team director, Maman Imanulhaq, mentioned that he was simply touched by Iriana’s responsive gesture towards the children at the campaign event. Maman also explained that Iriana had carried the children and offered them mineral water. Prior to this, the first lady had warned parents to not involve their children at campaign rallies. Iriana took the children to a more spacious place with adequate shelter. “She had ushered the children to a place where their parents could keep sight of them. Such a loving act in protecting children,” Maman added.